As 2016 dawns, carbon taxing has become more than just the preferred climate policy of economists. 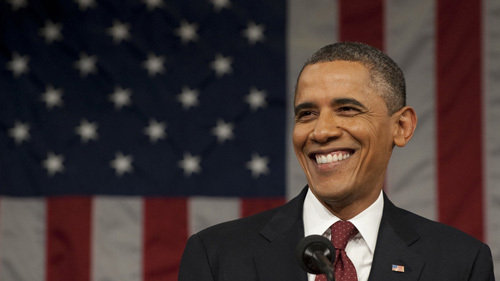 It’s taking center stage in policy discussions and climate organizing in the U.S. and around the world. 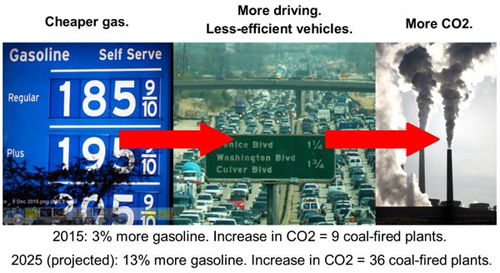 The Carbon Tax Center is helping to spur that process. Here is a summary of major carbon tax developments over the past year, including the Paris climate summit and Pope Francis’s elevation of climate in his June encyclical and his September visit to the U.S.
CTC drafted, convened, and on the eve of the Paris climate summit unveiled a “luminaries’ letter” calling on the Paris negotiators to prioritize carbon taxes, both for their own value as the most potent national-level climate policy and as a path to a harmonized global carbon price. The 32 hand-picked signatories comprise a virtual “who’s who” of leading climate economists and other “wise men” (and women) including four Nobel laureates, three former U.S. cabinet secretaries, and prominent academics from Harvard, Princeton, Stanford and the University of Chicago. The roster was bipartisan as well, topped by a Reagan secretary of state and a top Romney advisor, among others. Our outreach to the media led to extensive coverage. The pope’s June encyclical didn’t just decry climate change and call on humanity to address it, it also insisted that polluters bear the costs they impose. The encyclical engendered surprising pushback from a few prominent climate economists and journalists who misinterpreted Francis’s injunctions against carbon trading and offsets. We set the record straight — Francis is calling for polluters to pay, and he’s not interested in gimmicks that hide the price or unfairly shift the burden — and he amplified that message when he addressed Congress in September. CTC broke the story in April that a prominent national poll showed 2/3 support among Americans for a revenue-neutral carbon tax — a result that was buried in the data and hadn’t been reported.This and other polling in 2015 revealed that the idea of taxing carbon pollution and distributing the revenues fairly is gaining public acceptability. 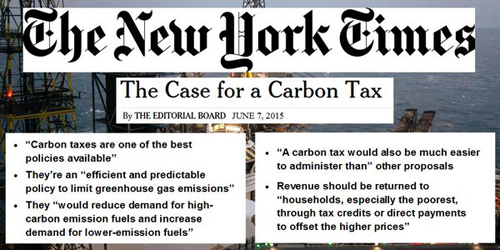 The New York Times’s post-Paris editorial urged nations to “embrace carbon taxes” — the second explicit mention of carbon taxing in a Times editorial. The first mention came in June when the paper issued a rousing endorsement of carbon taxes as “one of the best policies available” to fight climate change. 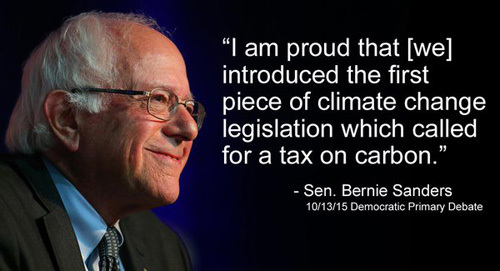 Five carbon tax bills embodying that approach were introduced in the House and Senate last year — including one by presidential candidate Sen. Bernie Sanders. In our view, they constitute a quantum leap in effectiveness, transparency and fairness vis-à-vis climate legislation under discussion only half a dozen years ago. We’re fairly certain our efforts both behind the scenes and in the public sphere, including running carbon tax scenarios for Hill staff, have contributed to this marked evolution. While none of the bills have a chance of passage in 2016 in the face of GOP denialism, they are a signifier of progress and a base to build on. We’re not betting on enactment of a federal carbon tax by this Congress, but we are encouraged by grassroots activism at the state level that may provide both a policy and political template that could eventually be emulated at the national level. 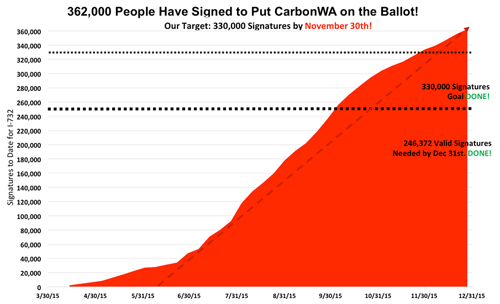 In particular, we’ve supported the grassroots effort underway to enact a carbon tax in Washington State, either through legislative action or a referendum in November 2016. The electoral defeat of Canadian Premier Stephen Harper and ousting of Australian Prime Minister Tony Abbott are strong signals of public dissatisfaction with anti-climate policies. The election of Justin Trudeau as Prime Minister and Rachel Notley as premier of Alberta hold out the possibility of a national carbon tax in Canada that could serve as a model around the globe. Meanwhile, new IPCC chair Hoesung Lee has joined IMF head Christine Lagarde in strongly endorsing carbon taxes. We worked hard in 2015 to highlight cheap oil as the “new climate villain” for engendering more driving and a reversion to gas-guzzlers — a trend that is poised to grow much worse. Unlike other commentators, we quantified this negative trend, not just in terms of CO2 emissions but, more viscerally, as equivalent to firing up nine coal-fired power plants last year alone. Looking back at last year has us excited about what’s to come in 2016. 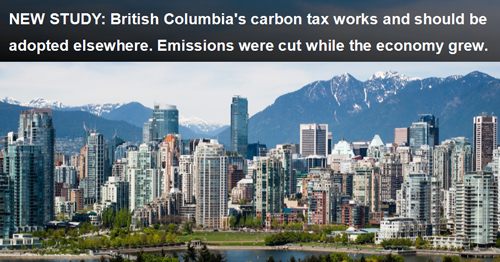 The Carbon Tax Center has been at the forefront of pursuing national carbon taxes that are proven to reduce carbon emissions. We intend to aggressively build on the positive developments of 2015 and make 2016 a banner year in the fight against climate change. I wrote on this topic at OpEd News this week.